Together with the Daily News, the Center for Public Journalism helped organize preliminary meetings and supported, designed and analyzed a citywide survey from the Insight and Survey Center, a survey-research unit associated with the School of Journalism of the University of Missouri-Columbia and the Reynolds Journalism Institute. Nearly 350 randomly selected people from across the city were phoned. 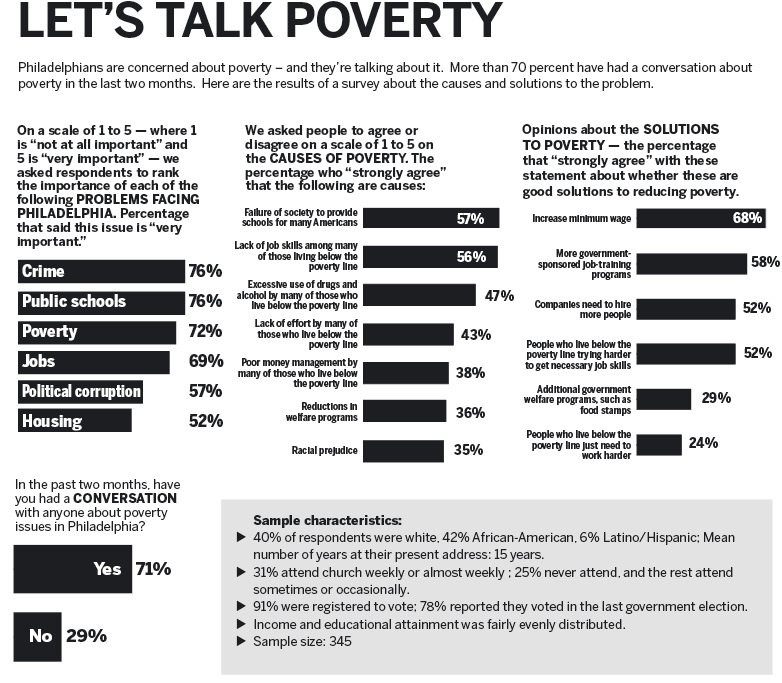 The results of this survey demonstrate that an economically, racially and educationally diverse cross-section of Philadelphians see poverty as one of the most important issues that the city must address to move forward, according to CPIJ Director Andrew Mendelson. More than 70 percent of respondents rated the related issues of crime, poverty and the public schools as “very important” for Philadelphia. PART TWO: How Philly became poorest big city in U.S.